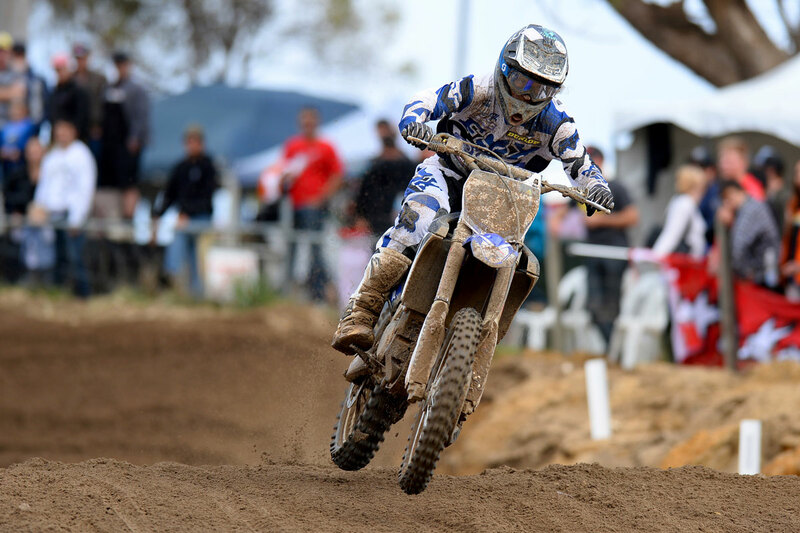 CDR Yamaha rider Billy Mackenzie has claimed the overall round win in the premier MX1 class at the fifth round of the 2014 Monster Energy MX Nationals. After rain and wind threatened to make the Wanneroo round in Western Australia, the weather held out and a huge crowd gathered to watch the country’s best riders tackle the sandy track. And it was Mackenzie’s consistency (first, second and fourth from his three races) that handed him his first overall win for the year. Series leader Matt Moss (Team Motul Suzuki) and his brother Jake Moss (National Pump Monster Energy Kawasaki) finished the event in second and third overall respectively – each claiming important points in the overall series as it hit the halfway point. KTM Motocross Racing Team’s Kirk Gibbs and Jake Moss finished in fourth and fifth overall. In the opening moto, Mackenzie took the holeshot and raced to the lead from Matt Moss, Jake Moss, returning retired Kiwi Ben Townley (Penrite Honda Racing) and Gibbs. The group seemed to have settled into the top five, but on the final corner of the opening lap Jake Moss lost control of his bike and went down, forcing him back into 10th. Mackenzie and Moss then proceeded to put a huge gap on the rest of the field, with Townley and Gibbs putting a break between themselves and fifth placed Kade Mosig (DPH Motorsport). In what ended up being a 13-lap moto, it was the middle of the race that provided the most action. On the fifth lap, Moss passed Mackenzie to get into first spot, Gibbs passed Townley to move into third and Jake Moss had clawed back into fifth spot. However on the sixth lap, both Moss brothers ran into trouble – first Jake came off after trying to pass Gibbs and Townley, and them Matt came down forcing him into second and a long way off the leader. In the end Mackenzie held on for the win with Matt Moss in second, Townley grabbing third, and Gibbs and Adam Monea in fourth and fifth respectively. In the second MX1 moto, Mackenzie took the holeshot before Jake Moss whizzed past him to take the lead. As the riders settled into position over the opening lap, it was Moss leading the way from Mackenzie, Monea, Gibbs, Matt Moss and Townley. Jake Moss and Mackenzie pulled away from the rest of the field, and finished the race comfortably in first and second positions. There was not much movement in the second race – Matt Moss dropped back to seventh before climbing back into fourth spot within two laps. The reigning champion pushed hard at the finish line to edge past Monea but he was held out, meaning Monea took the podium finish in third with Moss having to settle for fourth. Gibbs rounded out the top-five ahead of Mosig, while Townley drifted back into ninth by the time the chequered flag was waved. In the third and final moto, Mackenzie grabbed the holeshot but relinquished the lead soon after to both of the Moss brothers. Series contender Monea went down at the third turn and was pushed back towards the rear of the field, as Jake and Matt Moss took a stranglehold on the race. They finished the race in first and second place while Gibbs passed Mackenzie on the third lap and finished the race in third. Mackenzie ended the race in fourth while privateer Jacob Wright claimed fifth spot. Monea did well to ride through the field, and in passing three riders on the last lap of the race, ended the moto in eighth. It was an incredible return to racing for Townley, off the sidelines to replace countryman Cody Cooper, in his first MX Nationals appearance for over two seasons. 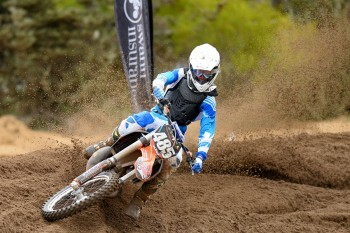 Following his seventh overall, he will now turn his attention to next weekend’s Manjimup 15,000. In the overall championship standings, Matt Moss has again moved 22 points clear of his closest rival Gibbs, while Jake Moss has leapt into third place outright. Rookie privateer Caleb Ward has continued his great form to take the round win in the Motul MX2 ranks at the 2014 Monster Energy MX Nationals in Wanneroo, Western Australia. The KTM-supported 17-year-old managed two race wins and a third placing from his three races, to take a comprehensive victory on the day and move into seventh place in the outright championship. Round four winner and SD3 Husqvarna rider Luke Arbon continues to build in confidence – his fourth, fifth and first place finishes taking him to second outright on the day. Josh Cachia (Penrite Honda Racing) rounded out the top three (eighth, fourth and second), while Jay Wilson (Serco Yamaha) finished the round in fourth and Hamish Harwood (CMR Redbull KTM) in fifth. Ward took the holeshot in the opening MX2 moto of the day, and despite pressure throughout the race from Harwood initially, and then Luke Clout (Serco Yamaha), he held on for the win. Reigning red plate holder Clout got off to a good start, moving into third place after the first corner and moving into second place past Harwood towards the end of the second lap. While Clout pressed Ward throughout the second half of the moto, he had to settle for second place in the race, and Harwood rode well to finish in third. It was the other title contenders who really raised eyebrows in the opening race. Brenden Harrison (Instant Security KTM) could only manage 14th place, while kiwi Kayne Lamont (Husqvarna Red Bull WIL Sport NZ Racing) struggled multiple times throughout the race and had to settle with an 18th placed finish. In the second MX2 moto Ward again took the holeshot, but his lead didn’t last too long with Wilson moving to the front of the field at the second turn. He was followed by Ward, Kale Makeham (Tunetech Reacing KTM), Clout and Cachia with Lamont back in 10th, Harrison in 14th and Harwood back in 16th. On the second lap Clout took a nasty tumble and by the time he could recover, he joined the field back in 24th. While he managed to finish the race in 18th, it might just be looked back on as a key moment in the MX2 championship race. On the fourth lap Ward fought back into a lead which he never relinquished, giving him the perfect result from the opening two races. Wilson finished in third and Makeham crossed the line in third. Cachia and Luke Arbon rounded out the top-five, with Harrison (eighth) and Harwood (11th) fighting hard to earn important overall points. The nightmare round continued for Lamont who rolled across the finishing line in 23rd nursing a severely injured shoulder. In the final moto of the day, Arbon claimed the holeshot and kept the lead for the entire race to claim a solid moto win. Wilson jumped straight into second spot and looked like he would comfortably hold onto it before he came unstuck on the second last lap, forcing him back into eighth. That mishap allowed a plucky Cachia to take second spot in the race, and round surprise packet Ward to claim another podium race finish. Geran Stapleton (Raceline Pirelli Suzuki) and Husqvarna supported Nathan Crawford finished in fifth and sixth respectively. In the overall championship standings Clout has had his lead whittled down to just 10 points, with Harwood, Harrison and Arbon all within striking distance of the series leader. Click here for Motoonline's images from the event.